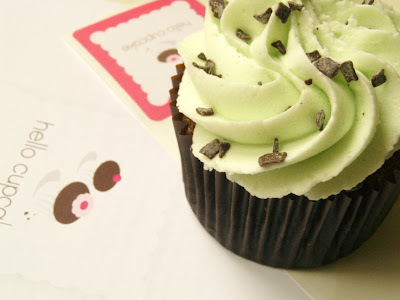 the shop is real cute with clean design and modern but vintage looking chairs and tables with a little counter for sitting and people-watching while munching on yummy cupcakes. I couldn't resist a few cupcakes I didn't inted to buy more then two but they have the cutest boxes for 4 packs and it has a little insert that holds the cakes in place and even has a space for you two reach two fingers around the cupcake which allows you to lift it out easily. additionally since its opening week and they've been slammed they have a four per person limit - which made it almost like a challenge - since i could only have four i suddenly wanted four! 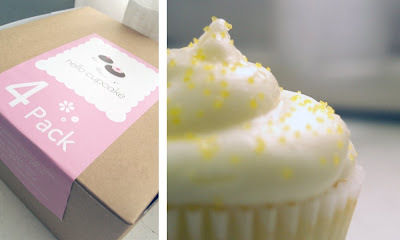 above is the cute box label and a lemon cupcake called "you tart"
mint chocolate chip . . .the mint icing is divine! 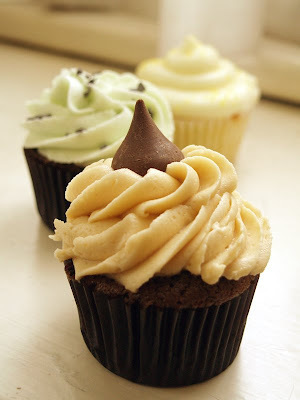 and i just had to try the "peanut butter blossom" since it looked so cute and is aptly named - the addition of the hershey's kiss makes this one complete! the last one i chose was rootbear float which had yumy rootbear flavored cake and is just available for the summer. if you live in the area you should definitely check out this trendy new shop!